I mentioned in my grocery budget post how we're resisting kid-specific foods because they can be ridiculously expensive. Part of Ada's standard breakfast each and every morning is a toaster waffle. We were buying the ones with Cookie Monster on the box -- blueberry minis by Earth's Best. One Sunday morning, something clicked. You HAVE a waffle maker, Ashley. Why are you still buying frozen? 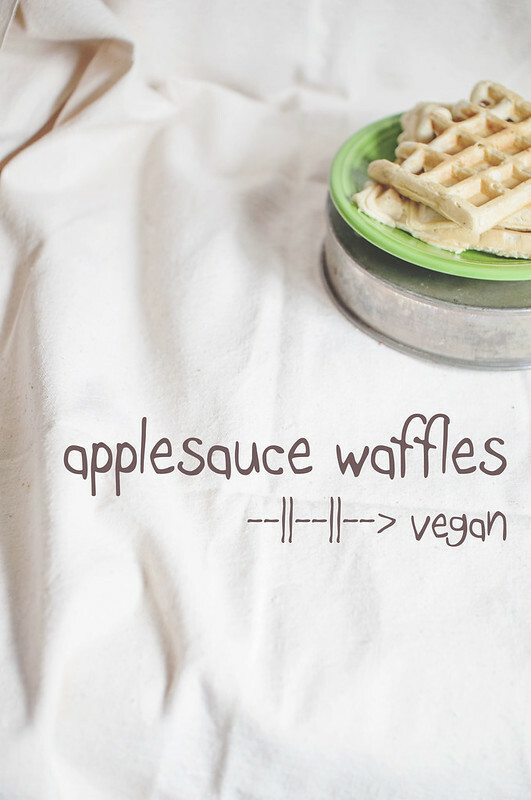 I've gone through various trials + tribulations trying to create a waffle recipe that is fluffy, doesn't stick to the maker, and freezes well in bulk. It features a mere 5 ingredients, too! I don't have an old box handy, but even with the "natural" label, I'm sure that beats Ada's old breakfast. The added nutritional bonus of the applesauce in this recipe is awesome. The natural sugars help the waffles develop a golden brown crisp. And you can taste the sweetness without adding bucketfuls of the white stuff. 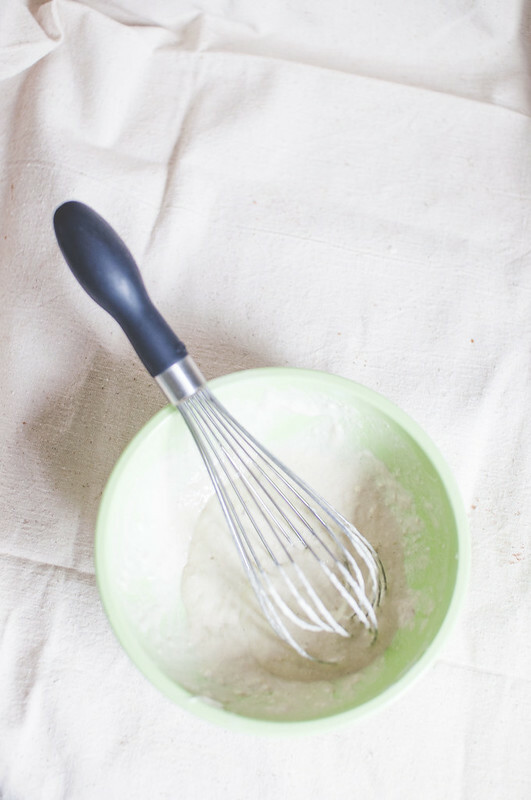 Whisk togehter all ingredients in a small bowl. Batter should be thick, but not dough-like. NOTE: You may need to add a few more tablespoons of liquid depending. This morning I added 2 tablespoons. Another day, it was just one. It depends on the moisture content of your applesauce AND how much flour your "1 cup" really ends up being. Feel free to double or even triple the recipe as desired, keeping in mind the note about the almond milk. Preheat your waffle maker. When it's ready, generously grease the top and bottom with Earth Balance or spray oil. Then scoop heaping 1/4 to 1/3 cupfuls and cook as directed. Eat immediately or follow the instructions below for storage. 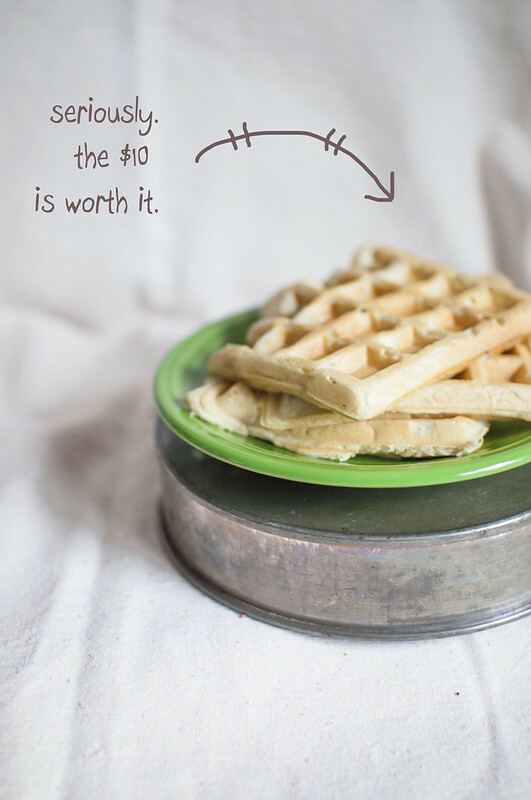 When making in bulk, it's helpful to let waffles rest on a drying rack so they don't get soggy while you're making the rest of your batch. 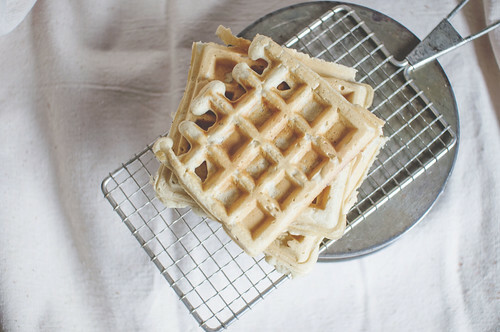 One cooled slightly, arrange waffles flat on a baking sheet, preferably atop some parchment paper. Place in freezer for 1 hour. Till they are frozen. Store them into a freezer bag + return to the freezer. Treat like store-bought waffles. No need to thaw. Just pop into toaster. What's your favorite vegetarian/vegan freezer meal? Stephen has a 4-day weekend, so I have lots of time to cook + I need ideas!